Thank you for visiting Nefyn.com. This site contains stories and photos of a former Nefyn resident. 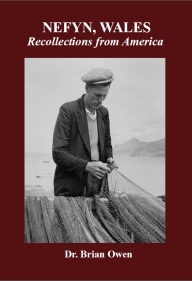 A book titled NEFYN, WALES Recollections from America is now available for sale online. Please feel free to look around and contact us if you have any questions. Go back to an earlier time in the tiny town of Nefyn, Wales. Visit with a way-of-life and characters who made growing up there so interesting. Focused primarily on fishing experiences on Nefyn Beach, the reminiscences of a former resident brings this unique little town to life. Visit the places and the recollections the author experienced. A pleasant group of tales that take you back to the good old days - a time to be remembered with fondness and nostalgia. Follow the author as he leaves Nefyn to pursue a career in America. There he meets other Welsh emigrants and visits places where some of his ancestors established roots in the 1800's and early 1900's. Not surprisingly, his own roots are firmly entrenched in a very special place – old Nefyn.